This 6 year old Hot dog shop has the look and feel of a franchise but is independently owned and operated. Benefit from the brand and product awareness without the royalty fees as well as the latitude to modify as you wish. Continue operating as is or with a few bucks convert to another concept - but the brand name is not included if converted! All the expense, time and headaches of a build out have been taken care of on this turn key operation. This is a great operation for a first time restaurant owner. 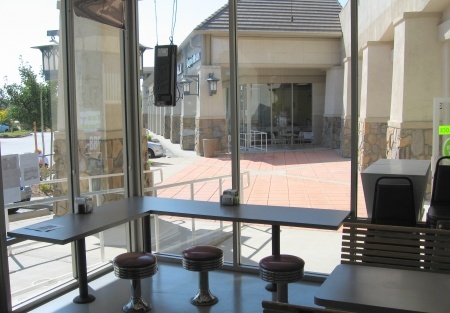 This location is located in a fast growing upscale part of Placer County and is in close proximity to High tech offices as well as surrounded by heavy daytime users and dense residential. The business has 4 years remaining on a 5 year lease; the base rent is $2400; CAM charges of $772. Take the next step and select one of the bright orange buttons below. When you register, you'll be given priority notification to new listings in the future, prior to the general public, and you'll also get more photos and the name and address of the restaurant. One of the busiest intersections in Placer Co.